You’re Getting Married in Iceland! Oh. My. Gosh! Lucky You!! Now bring on the endlessly AMAZING options for Iceland Wedding Locations… So I invite you to take a deep breath and savor our post today! I even dare you to close your eyes, revel in the beauty as you read your way through these amazing Iceland wedding locations. Then start asking yourself, if you see yourselves there, saying “I do!” in the midst of that epic landscape! Disclaimer: Several of the locations featured within this post are on private property and require special permissions that most people do not have (don’t worry, our Iceland Wedding Planning team of course does, because we are the offbeat Iceland adventure wedding experts!). Other locations may require specialized gear and vehicles to get to them. Good News! This is exactly why we specialize in planning Iceland Adventure Weddings, so when you fall in love with a location, please contact us and we’ll put together some crazy awesome unique Iceland wedding plans for you! It’s one of the most iconic landscapes in Iceland (and believe us, there are plenty of iconic landscapes to choose from in this country!). Reynisfjara Beach is located on the southern coast of Iceland, not far from the town of Vik. It’s famous not just for its black sand, but its three distinctive sea stacks, jutting out of the ocean. Many couples pay a visit to Vik Beach (in front of the town side) before shooting their wedding photos at Reynisfjara Black Beach. You could also consider a Basalt Sea Stack Wedding, if you’re so inclined. Reynisfjara Beach is also home to a rather unique columned stone wall that opens to form the mouth of a large cave. The cave provides a perfect, sheltered spot for a wedding ceremony, framing stunning views of the black sand beach and the Atlantic Ocean beyond. If you’re planning to visit Iceland during winter however, you will likely not be able to go inside of the cave (between November-April) as the waves consume the cave and making it CRAZY dangerous. Please Note: Since this blog post was written, this Iceland black sand beach wedding location has turned into a heavily populated tourist location. It is best to arrive shortly before sunrise or sunset to avoid the heavy tourist times. Also know to check the tide schedules to stay safe on this beach. This beach is known for it’s heavy riptides so please visit with care and knowledge. Is there anything more picturesque than adventuring to a private waterfall in Iceland to say your vows at? There are an endless amount of waterfalls in all sorts of shapes and sizes to choose from. But, did you know, that over 75% of Iceland is privately owned, therefore some of its most spectacular scenery is on private property (requiring in advance permission). One of our favorite private waterfall wedding ceremonies was Brandi and Zach’s from July 2018. Followed by the hidden waterfall elopement of JoAnne and Corbin. Finding you the most perfect, secret spot for your wedding ceremony is our forte and we have exclusivity at countless stunning private waterfall locations! Love the idea of having a wedding at a private waterfall where it’s just the two of you and your guests?! Connect with our experienced Iceland Wedding Planner team for more information. For panoramic coastal views, Dyrholaey Sea Cliff is a unique spot with a breathtaking outlook in all directions. The cliff is, quite literally, an island with a door hole. It’s possible to walk across the bridge of the of the cliff, where you can see as far as the Myrdalsjokull glacier in one direction, and Reynisdrangar’s sea stacks in the other. You will also find an impressive lighthouse at the top. Note: Since this Iceland Wedding Planner blog post was published, a crazy amount of ropes have been installed throughout this area. Before it was roped off and became heavily populated with tourists, we shot these wedding photos at Dyrholaey Sea Cliffs. It’s also possible to visit the bottom of the cliff, located on a dramatic black sand beach (photo above). Our Iceland Wedding Planner team has been granted exclusive access to this area by the landowner. When you step out of the super jeep, your jaw will drop as you marvel over the incredible view from this direction. A sunrise wedding ceremony at Dyrholaey Sea Cliff might be one of the most dreamy things we have witnessed! You may even cross paths with one of the local Puffins if you’re lucky! It’s famous for a reason, and this gorgeous glacial lake is a wedding photographer’s dream – a still blue lake surrounded by national park and filled with majestic icebergs. Note: To have a wedding within this national park space, you must ask for permission in advance (even if not bringing chairs or a setup for the Iceland wedding ceremony). Do you remember Richard and Bethany’s Glacier Lagoon wedding? Or what about visiting a more offbeat one that provides a more intimate experience during your Iceland wedding adventure like Melissa and Vince’s fall wedding? You’ve probably heard Iceland referred to as ‘the land of fire and ice’. The ‘fire’ moniker comes from its many, quite spectacular geothermal areas. Think bubbling mud pools, steaming hot springs and the occasional spurting geyser. Oh, and about 30 active volcanoes too! If your wedding day wish list requires something truly unique, consider one of these stunning locations and prepare for some truly epic wedding photos. Our Iceland Wedding Planner team also has exclusive access to some to some private geothermal areas that will have ZERO tourists. Iceland is famed for its numerous caves, many of which become stunning ice formations during the winter months. Caves provide a perfect, private space to exchange your vows, particularly if you want to shelter from some of the wilder weather that this country is known for. Visit our Iceland Wedding Planner blog to see the endless amount of caves our team has access to. Another of Iceland’s picture perfect waterfalls, Godafoss (also known as ‘the waterfall of the gods’) is a 30 meter wide, horseshoe shaped beauty in the north of Iceland. It’s a lovely spot for an intimate ceremony, complete with stunning views and the thundering soundtrack of water flowing through an ancient lava field and crashing into the river below. Iceland Wedding Planner Tip: We no longer have this location on our Iceland wedding location list (it has become too touristy for our taste) but if you are planning on your own, we highly encourage you to marry on the left side of the falls versus the touristy right hand side. See our previous Iceland elopement at Godafoss Waterfall for reference. For those who crave the beauty of Iceland’s natural landscape but still prefer a more traditional church setting for their wedding ceremony, Iceland has many options for you. There are beautiful churches dotted across the countryside, each with their own unique character and charm. Special Note: Iceland Wedding Planner no longer offers weddings or elopements in churches unless the couple embarks on an adventure afterwards like this couple who married in Vik Iceland. #9- Have an Icelandic Elopement in a field of Lupines! Do you love the color purple? Then how about saying ‘I do’ amongst a sea of lovely Lupines? During the time frame between mid June to mid July, the island is coated with millions of Alaskan lupine, it’s super dreamy! Please make sure before choosing a spot though please ask permission from the land owner or location before holding your Iceland wedding ceremony there (if not hiring us). Speaking of churches, Budir’s little black church would have to be one of the most instantly recognizable churches in Iceland. Búðakirkja is set in the midst of a lava field, with an epic glacier as its backdrop. And who needs a fireworks display if you’re lucky enough to see a spectacular sky show courtesy of the Northern Lights overhead? Of course, the Northern Lights are a natural phenomenon and their appearance is unpredictable. As much as we would love to ‘turn them on’ for our couples, it’s impossible to guarantee when and where they will appear. Certain times of year and certain locations do offer more favorable chances of spotting them however and of course, we know all of the best vantage points. You can find more information in our blog post about the Northern Lights in Iceland. Could there be a more powerful spot for a wedding to take place than the exact meeting point of two tectonic plates? The Silfra ravine is filled with crystal clear glacial water and surrounded by unspoiled national parkland. It’s an awe inspiring location and a magical setting for an intimate elopement ceremony. Rewind back to before tourists flooded this place, Chloe and Danny held their romantic wedding ceremony at Oxarafoss Waterfall in Thingvellir National Park. We no longer offer this location as part of our Iceland wedding locations (too touristy) but our friends at Iceland Weddings and Honeymoons can help you! This location does require in advance permission to hold a wedding ceremony there. #12- Iceland Wedding on top of a Cliff! What better vantage point to take in all of the beauty that Iceland has to offer, than perched on the top of a spectacular cliff. With a setting like this for your wedding ceremony, zero styling or decor is required. Do you remember Tim and Antonia’s cliff side Iceland Viking wedding ceremony HERE? For a completely unique wedding photo shoot, visit the famous wreck of a DC plane that crashed on a black sand beach back in 1973 (not to worry, everyone on board survived!). It’s a little off the beaten track and can be difficult to find. Of course, we know exactly how to get you here. Update: This location is no longer part of our Iceland wedding planner repertoire of locations as it has become too touristy (the area has no closed to driving and you must hike the 1-2 hours). For the right couple though, we have rented ATV’s like Petra and Jan did HERE for their honeymoon adventure. Picture this . . . An intimate wedding ceremony beside the ocean, framed by spectacular windswept coastal scenery and overlooked by a towering historical shipwreck. Oooh la la! See one of our previous elopements HERE that took Iceland wedding photos at that location. Kirkjufellsfoss is a beautiful waterfall surrounded by green fields and overlooked by the rather distinctive Mt. Kirkjufell. As far as picture perfect wedding locations go, this one couldn’t be more photogenic. It’s a blissful setting for your wedding portraits, or perhaps even an intimate waterfall wedding ceremony for two. Special Note: As tourism has increased, this sweet little location in the Snaefellsness Peninsula has been overrun. Arrive early to beat the crowds. Before it was heavily populated and roped everywhere, we photographed some gorgeous Iceland wedding photos HERE. Reynisfjara Beach might be the best known location for spotting basalt sea formations, but there are other, far quieter locations for spotting these spectacular lava structures. If you fancy having one of these Icelandic artworks in your wedding photos, we know just where to find them. Iceland’s landscape covers the full spectrum of colors and textures, from frozen glaciers to thundering waterfalls, from barren lava fields through to majestic green mountains – take your pick! In fact, our epic Iceland wedding adventures often span all of the above in a single day. Iceland is a hotspot for volcanic activity, and when these magnificent beasts erupt, they certainly leave their mark on the landscape – even thousands of years later. A visit to one of these ‘out of this world’ locations will make you feel as though you’ve landed on the moon! Relax, it’s just one more example of Iceland’s many and varied landscapes. No doubt there is another spectacular waterfall, glacier, mountain or beach … just a short drive away. If green is your color, why not consider the verdant surrounds of a sod farm wedding? Inspired by this? Head back to our previous Iceland Wedding Planner blog post HERE to see Ciara and Jared’s rustic ranch style wedding! Iceland offers the perfect setting for an adventurous elopement. And after a full day of exploring, it’s time to retire to yet another spectacular location and enjoy one more memorable experience. A romantic lakeside table just for two is the ideal spot to share a toast (and some delectable local cuisine!) while you celebrate your first day of married life. Remember these two lifetime sweethearts who wed at one of Iceland’s many fresh water lakes? Head back HERE to experience their fabulous day! 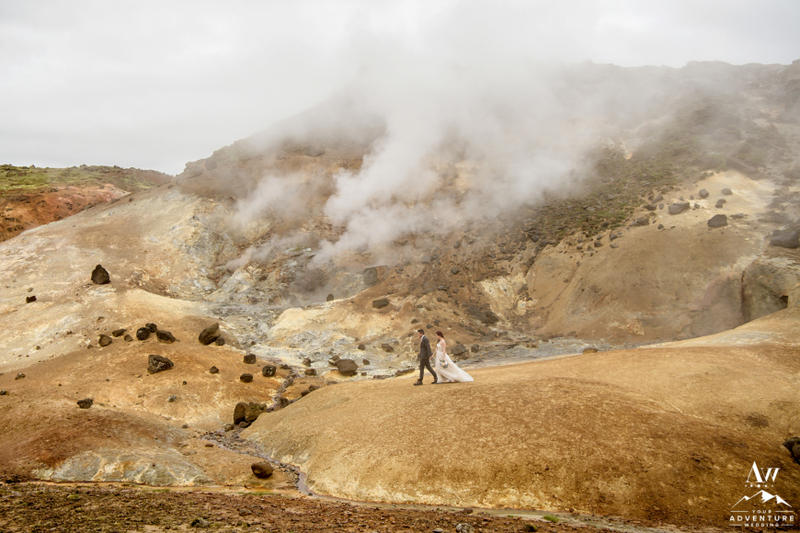 #21- Choose an Iceland Wedding Location that looks like another Planet! 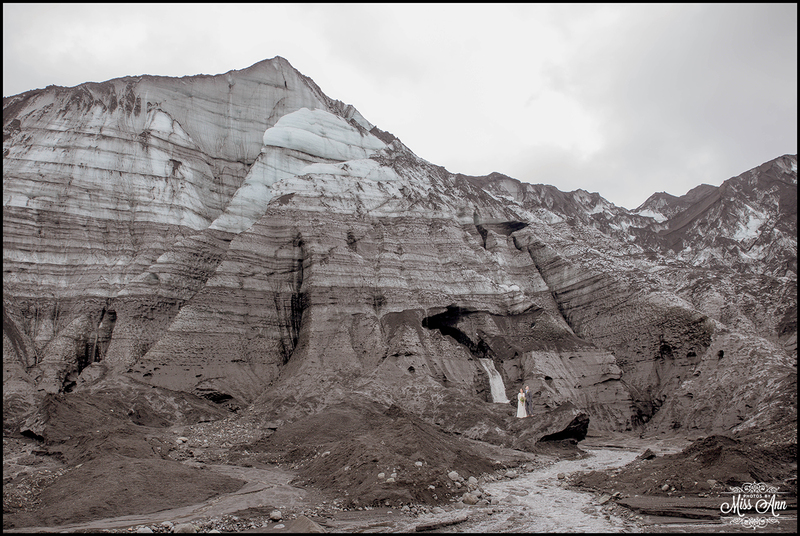 Does a barren glacier appeal to you? How about a jagged, rocky plain or maybe even a lava landscape or some steaming, bubbling hot springs? Iceland has just the backdrop for you! Just imagine exchanging your vows in one of these spectacular, otherworldly settings. If there’s one thing that Iceland does well, it’s a dramatic landscape. So when the locals refer to the Snaefellsness Peninsula one of the most beautiful and dramatic regions in their country, well, you can guess just how spectacular this area is. And while the Snaefellsness Peninsula is a little off the beaten path and often overlooked by most visitors, that just makes us love it even more. Although Iceland is known for its black sand beaches, it’s also home to several quite beautiful golden sand beaches. If you prefer a golden backdrop on your wedding day, these ‘off the beaten path’ beaches are well worth the trek. #24- Get Married in Iceland on top of a Glacier! Imagine exchanging your vows on top of a vast sheet of pure ice. How spectacular! Yes, it is possible, and Iceland is one of the few locations on earth where you can plan such a magical white wedding. What a beautiful time of day to enjoy Iceland’s spectacular landscapes all to yourself. Don’t even get us started on all of the incredible colors and hues that make an appearance at this hour. Fancy a towering Volcano as the backdrop for your wedding ceremony? Iceland has many active volcanoes so you have plenty to choose from! Admire the epic view as you exchange your vows in a field of ancient lava. Wow!! If you’re keen to capture the spirit of ancient Iceland on your big day, how about a wedding ceremony in front of a lovely grass covered house? Grass covered houses were actually the traditional building style in Iceland many centuries ago, and the oldest example dates all the way back to the 9th century. At one time there were over 100,000 of them dotted across the countryside, however a wave of modern development has all but wiped them out. Today these beautiful grass cottages are an endangered species and only a few remain. For a (rare) slice of history on your wedding day, why not exchange your vows in front of one of these cute, turf covered houses? #28- Hold your Iceland Wedding or Elopement at the base of a Majestic Mountain! Who needs props or decorations when you marry in front of a breathtaking landscape that has stood for millions of years? A majestic mountain (or two!) is one of our favorite wedding accessories! A sleepy little fishing village complete with stunning coastal scenery. Romantic, much? We couldn’t agree more! Imagine exchanging your vows against the backdrop of blue ice. Iceland’s ice caves come in many beautiful hues from clear right through to deeper blues, turquoise and even shades of violet. Your ‘something blue’ never looked so good! How about the beauty and the serenity of a wedding in the midst of Iceland’s vast and uninhabited highlands? The highlands are home to many of Iceland’s most spectacular sights, from mountains to glaciers, waterfalls to lava formations. This pristine wilderness area is only accessible at certain times of the year, so some forward planning is required if you want to ensure that you’re able to visit this piece of paradise for yourself. We would love to be your wedding day tour guides! If you’re dreaming of an epic backdrop for your Iceland wedding day, it doesn’t get much more impressive than this. Skogafoss and Seljalandsfoss are two thundering waterfalls located in the south of Iceland. They are actually located just 30 minutes apart, so you can easily visit both on your wedding day. And if the sight of a towering waterfall isn’t breathtaking enough, you can even walk behind Seljalandsfoss or hike to the top of Skogafoss for a totally different perspective. Can you picture your wedding against any one of these drop dead gorgeous backdrops? If you’re looking for more inspiration, you’ll find plenty on our Iceland Wedding Planner blog, and if you’re keen to learn all there is to know about weddings in Iceland, head over to our FAQ page. Or perhaps you’re ready to start planning your own epic adventure wedding or luxury elopement in Iceland. Perfect! You can get in touch with us here. We can’t wait to hear from you!